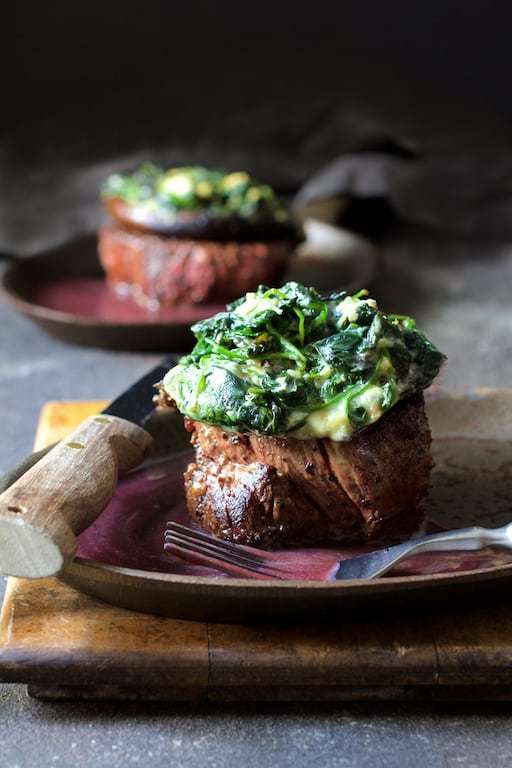 This "over-the-top" Beef Tenderloin Fillets with Spinach Cambozola Stuffed Portobello Mushrooms and Red Wine Sauce is entree and side dish all in one. SAUCE: Combine red wine, broth and tarragon in a small saucepan. Bring to a boil, reduce heat to low and let simmer while making the steaks. MUSHROOMS AND STEAK: Preheat oven to 375 degrees. Place mushrooms on a baking sheet and brush with 2 tablespoons olive oil. Bake for 5-6 minutes or until some of the water is released. Flip them over and allow the water to drain out while doing the spinach. While the mushrooms are baking, heat 2 tablespoons olive oil over medium-high heat in a heavy skillet or saute pan. Add the spinach and garlic and cook 3-4 minutes or until wilted. Prop one side of the pan up on a folded kitchen towel or several potholders and allow any excess liquid to drain off. Pour off the liquid or wipe out with a paper towel. Stir in the Cambozola cheese, then divide mixture evenly in the Portobello mushrooms. Set aside. Pat steaks dry and season generously with salt and black pepper. Heat butter and remaining 1 tablespoon oil over medium-high heat in a heavy skillet or sauté pan until it shimmers. Add steaks and brown well, approximately 2-3 minutes per side, adjusting heat as necessary to prevent fat from smoking. Place the stuffed mushrooms in the skillet along with the meat and transfer to the oven. Cook 5-6 more minutes for rare which is approximately 120 degrees in the center. Tent with foil to keep warm. FINISH SAUCE: Whisk the butter into the red wine sauce. Season with salt and black pepper if desired. Top steaks with mushrooms or serve alongside. Serve sauce with steaks.